Dent LG, Manning SA, Kroeger B, Williams AM, Hilmi AJS, Crea L, Kondo S, Horne-Badovinac S, and Harvey KF. (2019). The Pix-Git complex is essential to coordinate epithelial morphogenesis and regulate myosin during Drosophila egg chamber development. PLoS Genetics (in press). Stedden CG, Menegas W, Williams AM, Zajac AL, Cheng S, Özkan E and Horne-Badovinac S (2019). Planar polarized Semaphorin-5c and Plexin A promote the collective migration of epithelial cells in Drosophila. Current Biology, 29, 908–920. Zajac AL and Horne-Badovinac S (2017). Tissue structure: a CIVICs lesson for adipocytes. Current Biology, 27(18), R1013–R1015. Horne-Badovinac S (2017). Fat-like cadherins in cell migration — leading from both the front and the back. Current Opinion in Cell Biology, 48, 26–32. Barlan K, Cetera M and Horne-Badovinac S (2017). Fat2 and Lar define a basally localized planar signaling system controlling collective cell migration. Developmental Cell, 40, 467–477. Williams AM and Horne-Badovinac S (2016). Shaping the Drosophila egg. Molecular Reproduction and Development, 83(12), 1045. Cetera M, Lewellyn L and Horne-Badovinac S (2016). Cultivation and live imaging of Drosophila egg chambers. Methods in Molecular Biology, 1478, 215–226. Isabella AJ and Horne-Badovinac S (2016). Rab10-mediated secretion synergizes with tissue movement to build a polarized basement membrane architecture for organ morphogenesis. Developmental Cell, 38(1), 47–60. Andersen D and Horne-Badovinac S (2016). Influence of ovarian muscle contraction and oocyte growth on egg chamber elongation in Drosophila. Development 143, 1375–1387. Isabella AJ and Horne-Badovinac S (2015). 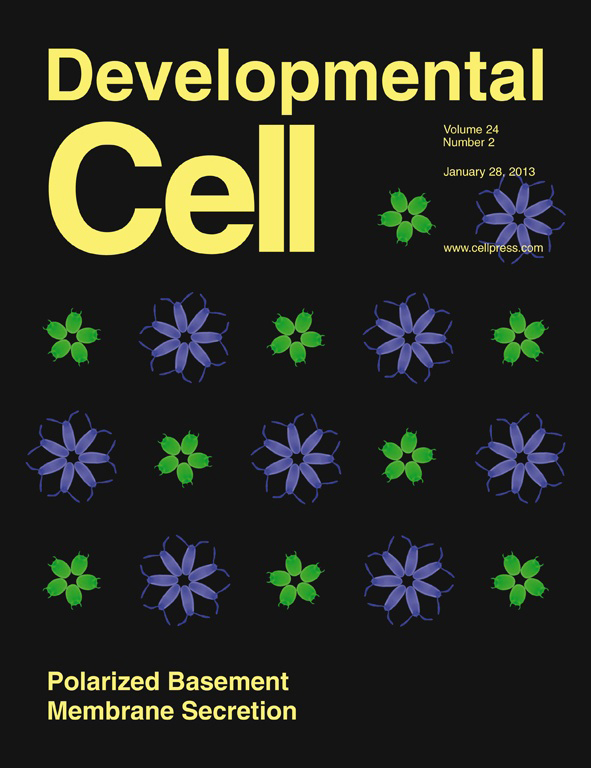 Building from the ground up: basement membranes in Drosophila development. Current Topics in Membranes, 76, 305–336. Isabella AJ and Horne-Badovinac S (2015). Dynamic regulation of basement membrane protein levels promotes egg chamber elongation in Drosophila. Developmental Biology, 406, 212–221. Cetera M and Horne-Badovinac S (2015). Round and round gets you somewhere: collective cell migration and planar polarity in elongating Drosophila egg chambers. 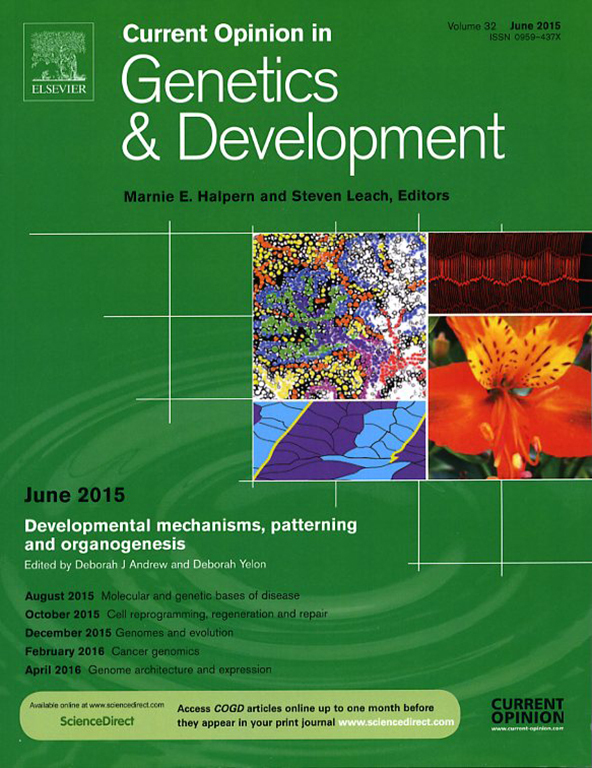 Current Opinion in Genetics & Development 32, 10–⁠15. Cetera M, Ramirez-San Juan GR, Oakes PW, Lewellyn L, Fairchild MJ, Tanentazapf G, Gardel ML and Horne-Badovinac S (2014). Epithelial rotation promotes the global alignment of contractile actin bundles during Drosophila egg chamber elongation. Nature Communications, 5:5511. Horne-Badovinac S (2014). 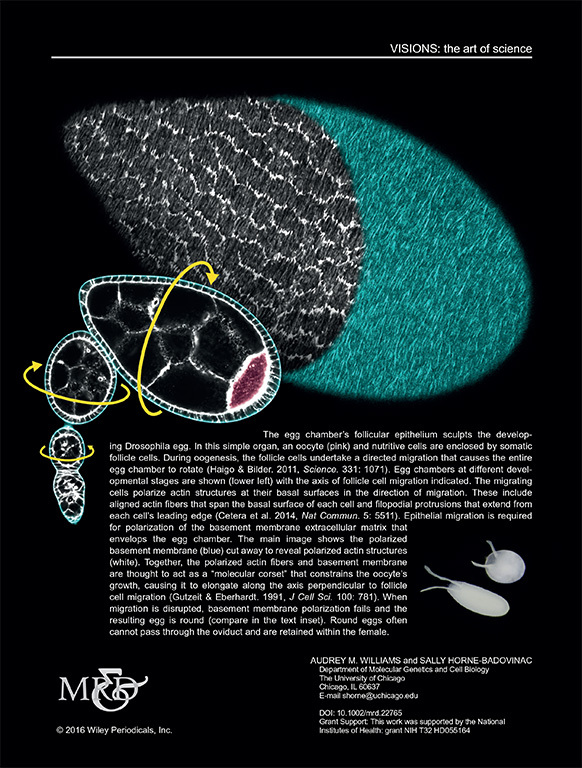 The Drosophila egg chamber – a new spin on how tissues elongate. Integrative and Comparative Biology, 54(4), 667–676. Horne-Badovinac S (2014). ASCB Annual Meeting Highlight: Cell-cell and cell-matrix interactions. Molecular Biology of the Cell, 25(6), 731. Lewellyn L, Cetera M and Horne-Badovinac S. (2013). Mishapen decreases integrin levels to promote epithelial motility and planar polarity in Drosophila. 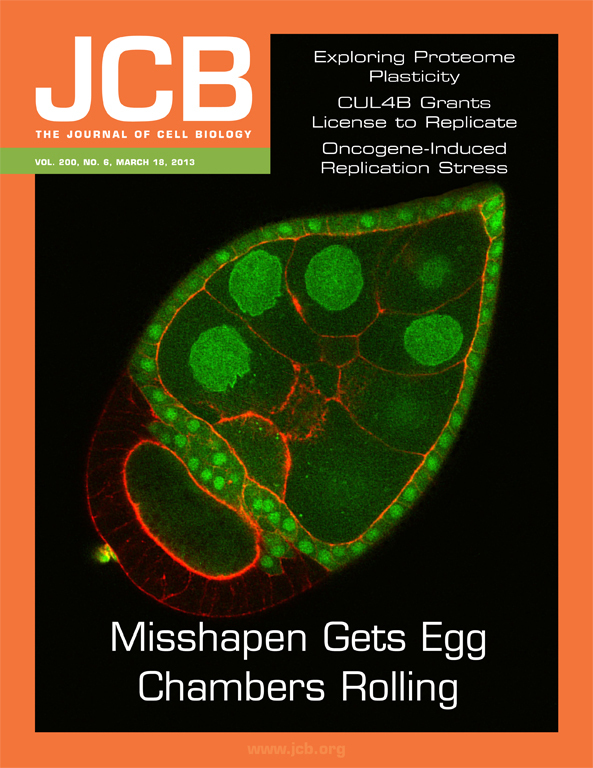 Journal of Cell Biology, 200(6), 721–729. Lerner DW, McCoy D, Isabella AJ, Mahowald AP, Gerlach GF, Chaudhry TA and Horne-Badovinac S (2013). A Rab10-dependent mechanism for polarized basement membrane secretion during organ morphogenesis. Developmental Cell, 24, 159–168. Horne-Badovinac S, Hill JJ, Gerlach G, Menegas W and Bilder D (2012). A screen for round egg mutants in Drosophila identifies Tricornered, Furry and Misshapen as regulators of egg chamber elongation. Genes|Genomes|Genetics, 2(3), 371–⁠378. Horne-Badovinac S and Munro E (2011). Tubular Transformations. Science, 333(6040), 294–295.